Okay, before I get into this recipe I want to say, go visit Montreal! UM beautiful! We were about an hour north of the city on a beautiful lake…boating, jacuzzi, board games, grilling & friends – what more could you want! It was around a 6hour drive from Boston – super simple, but by the time we got home I wanted to veg out on the couch. The hub went straight to bed cause he was feeling sick, so clearly the idea of the grocery store was not in the cards! With half a watermelon in the fridge, I decided to whip up a Meatless Monday dish on Sunday! I got my inspiration to grill watermelon from the grilled shrimp salad I posted last week. Boy oh boy how I love grilling anything! Hope you enjoy this simple & light salad! 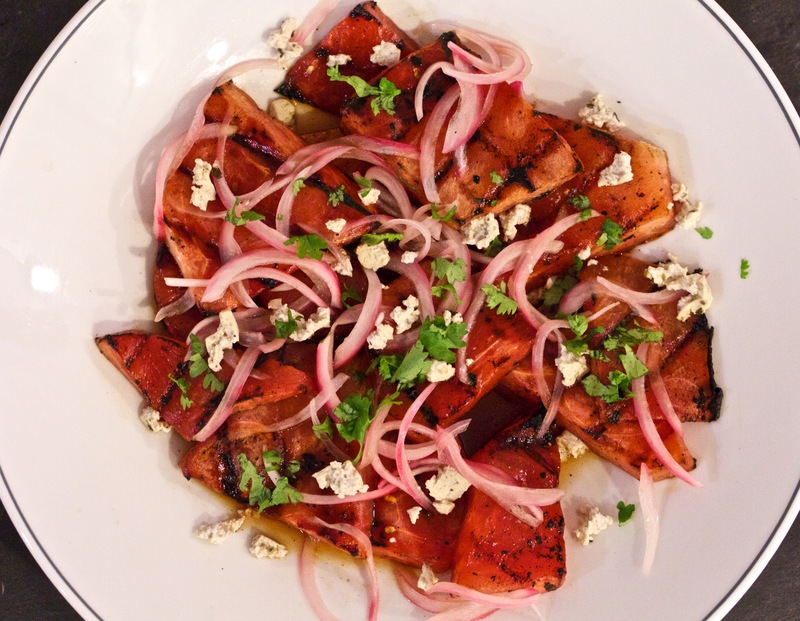 To assemble, place grilled watermelon on a large plate, top 1/2C red onion (no juice), 1/4C crumbled tofu ‘feta’ & a sprinkle of chopped cilantro – then drizzle 2T of the juice from the red onion mix. *We just got homemade honey from our friend – his pops makes it in Flora, Indiana! Literally, he has his own beehives & tends to them! This honey is so pure & smooth, can’t wait to get more from him! This salad is simply refreshing & all the fresh flavors pump it up to be a showstopper! Whether this dish is made just for you or if you want to impress your guests at your next dinner party, this will surely do the trick! I served this salad as a main with a side of grilled tofu – light & fresh for a perfect summer night! I am in love with all sorts of Israeli food right now, so get used to these posts for a while! Anywho, this dish is a staple in Israel, throughout the states & world. I can say though, the blend in Tel Aviv was fresher then ever & I gobbled this salad up daily at the beach! If you want to go crazy add a dollop of fresh tahini or hummus on top before serving! Enjoy this fresh & easy mix any time of year, but especially for bikini season!